My students love TASK CARDS! And they love using their mobile devices, so set the cards around the room and watch your students go to work building their vocabulary! 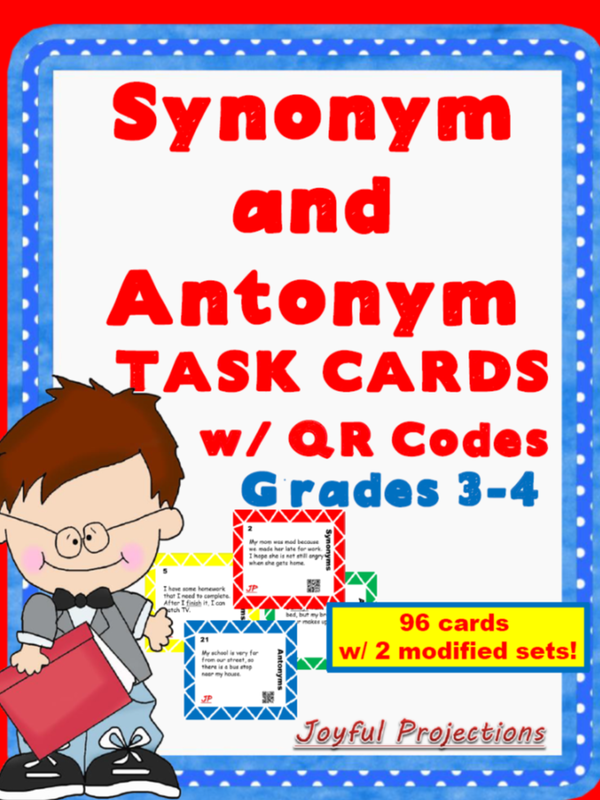 There are 24 cards in each set: Antonyms, Modified Antonyms, Synonyms, and Modified Synonyms. Students will read the sentences on each card and locate two words that are synonyms or two words that are antonyms. The modified cards have one of the words underlined. When the pair of words is identified students may either record the match on their answer sheet or check their own work with a QR Code Reader. Cards are leveled for 3rd and 4th grade, and another set for 5th and 6th grade. Lots of different ways to use the cards - task cards, literacy centers, scoot cards, or use as a quiz. All are great ways to begin building a better vocabulary!